Fabricated from the highest-quality, 304-grade steel, they are the most hygienic material for any area where food is prepared. Each cupboard is made to order in our Nottingham factory, meaning you can specify the precise size of unit you require, to fit even the most awkward of spaces. Whether you need wall-mounted cupboards or base units – or a combination of the two – we can fabricate the exact item/s you require, to your specifications. The options also include a choice of open cupboard for ease of access to shelving, or two door types: either hinged or sliding. We can also supply plinths and a variety of different handles, including recessed and D-shape. Our stainless steel floor cupboards can also be supplioed with a fully configured stainless steel worktop fitted to the top. Because we incorporate no wood into these premium carcasses, there is no swelling or rotting over time – meaning the cupboards will retain their shape and will last for decades. They are also the most hygienic choice: the food-grade metal is naturally antibacterial, making it easy to clean and facilitating the maintenance of a high-hygiene environment. DSM kitchen cupboards are ideal for use in commercial kitchens, as well as academic facilities and domestic settings. Please refer to the relevant section for more information on your sector. DSM’s stainless-steel kitchen cupboards will last for decades, making them the financially-sound option for your academic institution. Whether you require a single unit for a nursery or preschool, or an entire kitchen for a further or higher education facility, we can fabricate the products you need. Made from high-quality, 304-grade steel – which, thanks to naturally-occurring antibacterial properties, is the most hygienic material on the market – our kitchen cupboards are supremely hygienic and will meet all current Health & Safety and Food Hygiene regulations. They are also easy to clean, and will retain their distinctive sheen for decades to come. Each carcass is made to order, giving you ultimate control of the kitchen’s design, to ensure the most practical storage solution for its end users, whether you are furnishing a food technology room or a faculty kitchen. cupboard can be left open for easy access, or can feature a choice of either sliding or hinged doors (the latter is ideal where space is at a premium). DSM’s kitchen cupboards are just one set of products within a wide range of stainless-steel items for the academic sector. For more information on how we can assist with your project, contact us today. Our stainless-steel cupboards for commercial kitchens are the most robust model on the market. Designed for the catering arena, they are made from only the highest-quality, 304-grade steel throughout. This steel meets all current Food Hygiene and Health & Safety regulations, making it ideal for a catering establishment. It also boasts antibacterial properties and is easy to clean, ensuring the maintenance of an ultra-hygienic environment. optional plinths: removable or fixed. At DSM, we can create any size of order – from a single cupboard to a large number of units. We always meet our deadlines, meaning you can plan your fitting schedule in the confidence that all items from us will be delivered on time. Take a look at the other products we supply to the catering sector, which include bespoke worktops, extractor canopies, hand-wash basins, sink units and wash troughs – or contact us today, to discuss the precise requirements for your project. 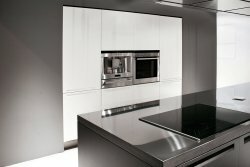 With its highly-reflective surface and modern styling, stainless steel is the ideal choice for a contemporary interior. Our bespoke stainless-steel kitchen cupboards make the most of the lustre of the steel, together with its durability and functionality. Highly adaptable, to suit your tastes and requirements, and with easy-clean properties, these cupboards will provide a beautiful core to your kitchen scheme. All of our kitchen cupboards are made on-site in our Nottingham factory from a raw sheet which comprises around sixty per cent recycled material – and the end product is fully recyclable, making these units by far the most environmentally-friendly option on the market. What’s more, they are so durable, we supply them with a twenty-five-year guarantee*. add optional plinths – either fixed or removable – for a streamlined finish. As well as kitchen cupboards, we offer bespoke worktops, plus sinks and hand-wash basins, so that you can create a truly stylish, fully-integrated home kitchen. Get in touch today, to find out more about our stainless-steel products for your home.